The Lake Oroville Marina is located in the Lime Saddle Recreation Area about 75 miles north of Sacramento. It has five spacious houseboat configurations available for you to rent. 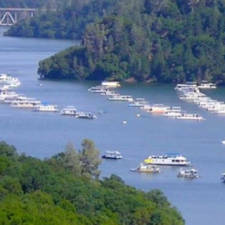 Also available for rent at Lake Oroville Marina you will find ski boats, deck cruisers, and powerboats. A convenience store and snack bar are located at the marina for all those last minute supplies that you will need to pick up. Other services you will find here include a fuel dock and camping options including floating campsites.